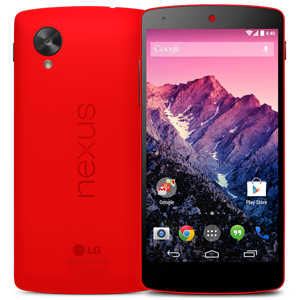 The Google Nexus 5, released in Q4 2013, has been created in collaboration with LG. As with all previous Nexus devices, the Nexus 5 runs on a clean version of Android, in this case Android 4.4 KitKat. The Nexus 5 is powered by a powerful Qualcomm Snapdragon 2.3GHz quad-core processor, 2GB of RAM and an Adreno 330 GPU. The 4.95" True HD IPS Plus display has a resolution of 1080 x 1920, with a pixel density of 445 ppi. Storage comes in at either 16GB or 32GB. Other features include an 8MP camera, LTE connectivity and a 2300mAh battery.